William Porter stared out the window as the Greyhound rumbled over the stone bridge that spanned the Big Moose River. The bus had been nearly full when it turned up Route 95 from Portland, but as it passed over the bridge Will was one of only three remaining passengers. When the vehicle pulled to a stop in front of the Riverton diner, Will Porter grabbed the aluminum tube he’d previously set beside his seat. The tube carried the scars from years of hard use. The once bright metal had tarnished over time. There were scratches across its surface, a dent on one side, a few dings on the other. Will slung a canvas duffel over his shoulder and stepped down into the morning sunlight. Although it was the first week of September, the temperature had barely broken sixty degrees. The cool breeze blowing off of Moswa Lake caused him to roll down the sleeves of his flannel shirt. When he was a kid Will’s parents had spent two weeks each summer in a rented cottage alongside the lake. His mother shopped in the stores and ate in the restaurants along Riverton’s main street while his father spent much of his time on the river. Will’s father preferred to fish alone, but on occasion, his son had accompanied him, watching from the riverbank while the man cast flies he’d tied back home in Pennsylvania. Will’s father was laid off from the Allentown steel plant when Will was nine. His parents divorced three years later. William Porter continued to live with his mother after the divorce. She remarried to a man who worked for a large corporation. They moved to New Jersey when the man was transferred to the company’s main office. Although in his late-fifties, Will’s father found work, stocking shelves at a Lowe’s and later in a Walmart. He saw his father once or twice each winter after Will and his mother moved out of state. 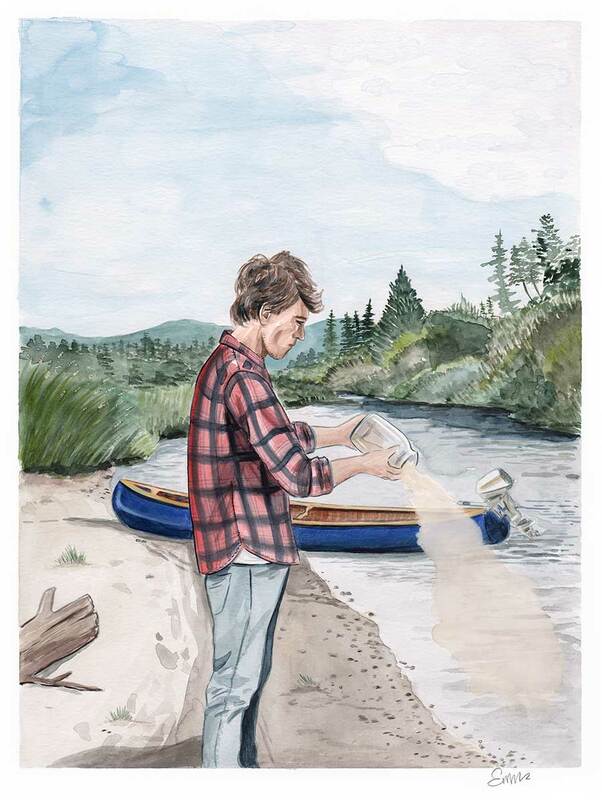 Each spring, his father would tie an old wooden canoe to the top of his Jeep and make the twelve-hour drive to the western Maine town where he’d camp alongside the river for two weeks. Lowering the brim of his cap, Will Porter trudged up the street. Stopping at a storefront, he stared at a large wooden trout that hung from two chains above a sign identifying the place as THE RIVERTON SPORTS SHOP. Under the trout was another sign that declared: We don’t have WIFI. Pretend it’s ninety ninety-five. A bell jingled when Will opened the door. Unlike Will, whose hair fell over his ears, the man behind the counter had his hair cut short. His salt-and-pepper beard curled outward with no apparent attempt to keep it under control. “Can I help you?” The man looked up from a vise where he had been putting the final wraps of thread over the head of a streamer with a silver body and pink wing. “Porter. Sure.” The man stared across the counter as if taking Will’s measure. “Glad to see you made it,” he said after a moment. “Everything set?” The younger man leaned the tube against a glass display case that contained different size reels. Will pointed toward the display case. “I’ll need a reel. Cheapest you have,” he said. The man pulled a reel from under the counter. It contained a fly line. Porter handed the man his credit card. The man turned toward the register. The man turned back toward Will. He returned Will’s card and slid a receipt across the counter. After Will scratched his name on the receipt, the man gave him a copy. “You’ll need this.” The man handed Will another slip of paper. Will placed the paper in his shirt pocket and walked back out into the sunlight. William Porter walked up the street and out of town. He carried the aluminum tube in his hand and the duffel bag slung across his shoulder. Forty minutes later, he found the narrow trail on the far side of the stone bridge that the bus had passed over earlier that afternoon. The young man followed the trail along the side of the river for a short distance before coming to a canoe. The dark blue craft had been set on its side. Underneath were two paddles. A lock secured a chain strung through the boat’s thwarts and around an ancient spruce tree. Tramping through the tightly packed conifers, Porter found the four-horse-power outboard where the shop’s owner had said it would be. Searching further, he found a five-gallon can of gas. Will carried the engine out of the forest and set it beside the canoe. He did the same with the gas tank. Reaching inside his shirt pocket, he found the slip of paper with the combination for the lock. He slid the aluminum tube and his duffel into the canoe and secured the chain around the tree. He lifted the outboard onto the canoe’s square stern and connected the hose to the gas tank. Will placed the two paddles within easy reach and climbed into the boat. It took a few pulls but eventually the engine caught. Placing it in reverse, Will backed the canoe into the river that was deep and wide. Although the current was strong, the outboard allowed him to make good time as he navigated around the occasional hunched-back boulder. The trail alongside the river had petered out as spruce and balsam closed in on either shore. Will caught a glimpse of the mountains that separated Maine from Canada each time he motored around a bend. The breeze that had blown down the main street of town could not get to him between the banks of the river and as the temperature rose, he unbuttoned his flannel shirt and rolled up the sleeves. The young man took it as a good omen when he spotted an eagle circling on a thermal current high above him. In the motel room in Portland, William Porter had gone over a map he’d found in his father’s apartment. He recognized the wooden dam when it came into view and motored the square-stern canoe toward the shoreline. It took him three trips and over two hours to portage the outboard above the dam, then the gas tank and paddles, and finally the rod tube and duffel. The young man sat on the timber that held back Hawley Pond. He knew from studying the map that the water above the dam was known as Beaver Cove, a narrow arm of the larger pond. Will lit a small propane stove and brewed a mug of tea. Sipping the tea between bites of beef jerky, he stared out over the cove. As if on cue, a moose broke through the conifers a hundred yards or so up from the dam. As it did, a loon cried out from farther up the arm of the cove. The cow tramped into the water. The massive animal stood up to her knees before lowering her bulbous nose through the surface. The loon called a second time. The bird’s cry echoed between the spruce-studded hills that rose above the cove’s shoreline. After a while, Will trudged back down the river. Raising the canoe onto his shoulders, he spent the next thirty minutes carrying the aluminum craft up to the dam while doing his best not to break an ankle on the many exposed roots and boulders along the side of the river. By then, the sun had swung around to the western shoreline of the cove. Will figured it to be around three in the afternoon. The water in the cove looked “fishy” as his father had liked to say, and he wondered if his father had ever swung a fly through its tannin-stained water. Will saw two more moose while motoring across the main section of the pond. He first saw the cow standing in the shallows along the eastern shoreline and then her calf. Born that spring, the calf peeked out from behind its mother when Will passed by. It took him three tries before he found the entrance to the Little Moose River. By then, the sun had slipped behind the hills. As it did, the temperature fell back into the sixties, causing the young man to button his shirt back up. Above the pond, the river’s serpentine course was darker and slower than that below the dam. Although there were few boulders, Will was forced to navigate around a number of spruce trees that had fallen across the river. He remembered his father saying that fish liked to hold under such trees that his father had called sweepers. The forest grew tightly along either side of the stream. Around one bend, Will looked up to find an owl staring down at him from the top of an ancient arborvitae. The bird glared down at William Porter with eyes as orange as a campfire’s flames. A few minutes later, Will came upon a shoal. After pulling the canoe out of the stream, Bill unloaded his gear. He found a large limb that had fallen to the ground and dragged it across the cobble. Will set a tarp upon the damp stones in front of the limb and started a twig fire at the water’s edge. After sipping a second mug of tea, he screwed off the top of the aluminum tube and pulled the two ends of a cane rod from a felt liner. Securing the reel he’d purchased at the shop in town, Will slid the ends together and worked the fly line through the guides. Will knotted one of his father’s wet flies to the tippet. The young man hadn’t cast a fly rod since he was a kid, but after a while seemed to get the hang of it. Will watched the current pull the fly below the surface and felt the fish hit as soon as he twitched the rod tip. Twenty minutes later, William Porter carried three brook trout back to the tarp. He placed the trout in a baggie and added flour and breadcrumbs. After shaking the bag, Will rekindled the fire and fried the fish in his father’s cast-iron skillet he’d brought along for that purpose. Porter gathered enough wood to get through the night. After cleaning out his dish, he sat back against the tree limb. Above him, a half moon had appeared above the darkened hills. Will awoke sometime during the night to find the fire burnt down to coals. After adding wood, he huddled closer to the flames that renewed their effort to keep away the falling temperature. Above him glittered a universe of stars. Will hadn’t seen the Milky Way in many years, and marveled at the soft glow that cut a wide swath across the sky. In the morning, William Porter once again rekindled the fire that had died out sometime during the early morning hours. He was cold and stiff. Will crouched beside the stream and splashed water on his face. After another mug of tea, Will decided this was as good a place as any other. Digging through his duffel bag, he found the glass jar that was protected by a thick towel. Walking over to the stream, Will unscrewed the lid. He watched silently as ashes from the jar mingled with the current. After gathering his things, the young man looked upriver. William Porter figured there was still time before he’d have to head back downstream. Time for him to fish the water above the shoal and maybe above that.